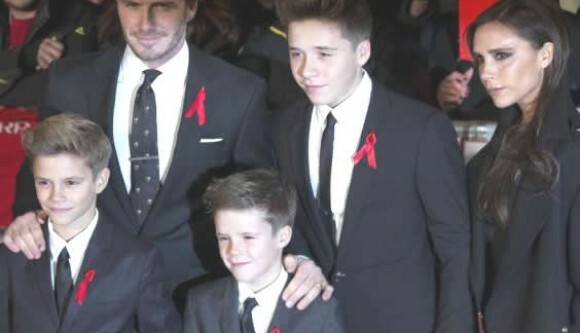 Following in His Footsteps: David Beckham’s Kids Want “Mum and Dad” Tattoos! David Beckham may not want his kids to follow in his footsteps when it comes to his extensive collection of tattoos, but the inked-up father of four admits that he can’t really stop them from getting tats without seeming like a hypocrite. The same goes for Victoria, who has a few tattoos of her own, although they are far less visible than David Beckham’s tattoos. To date, David has more than 32 tats inked on his arms, neck, chest and back, including at least eight tributes to Victoria, and an image of a giant guardian angel on his back with the names of his sons. Victoria has just six tats to her name, but they are all tributes to her loving husband and children. Sounds like it runs in the family! We all know that David Beckham loves getting inked, but during an interview on The Jonathan Ross Show, David revealed this cute little tidbit about his kids: “They’ve already said they’re having tattoos done. And I said, ‘Well, be different, don’t have any tattoos. And they said, ‘No, we’re going to have one. We’re going to have “Mum and Dad.”’ So I can’t really say no to that.” After all, David has quite a few tributes to his children inked on his body, including the names “Romeo,” “Brooklyn” and “Cruz” inked on his back and “Harper” inked on his chest. He also has an intricate tattoo on his chest depicting Jesus being lifted from his tomb by three angels – a tat that David says represents his children taking care of him when he’s older. We think it’s super cute that David and Victoria’s kids want to honor their parents with tribute tattoos, but this isn’t the first time Romeo, Brooklyn and Cruz have showed some interest in getting inked. One of the boys even went so far as to ask Dad how old he has to be before he gets his first tattoo! David’s response: “A lot older than you are now!” There’s no doubt that he loves his parents, and he may even opt for a “Mum and Dad” tattoo like his brothers in the future, but it looks like Romeo may be going in a different direction when it comes to future ink. The adorable 10-year-old debuted a fake “Harper” tattoo last year in honor of his baby sister, in the exact same spot as David’s “Harper” chest tattoo. Like father, like son!